Although some of the families in Hatch Homes’ service area live in climates, like Charleston, SC, that remains the same temperate all year long, others, such as those in Asheville, NC and the surrounding area, experience long winter seasons, if you reside in one of the regions of North Carolina or South Carolina that often gets hit with winter weather, there are several things you need to be prepared for concerning home maintenance. Roofs, for example, can honestly take a beating during the coldest months of the year. As you read the remainder of this guide, you will learn about four of the most common roof problems you are likely to experience when wintertime rolls around. By being aware of these potential issues, you will better be able to handle them if they do happen to arise for you this year. Preparation is key to keeping your house in good shape all year long! 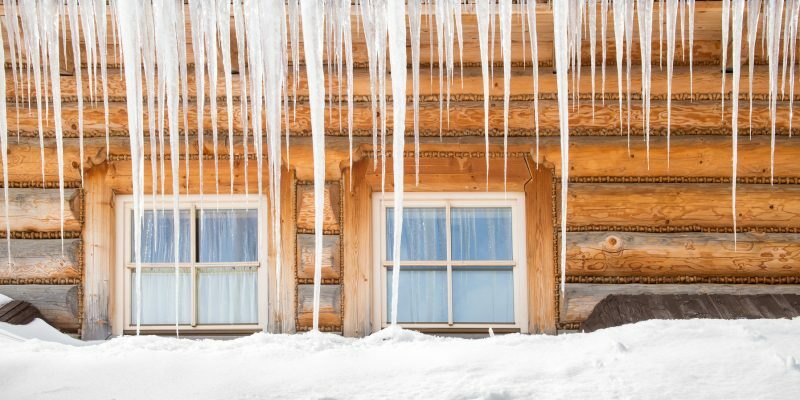 Ice dams – Ice dams are, as you probably suspected from the name, ridges of ice that form on roof edges when water collects in slightly above-freezing weather and doesn’t drain when the temperature drops below freezing again. Ice dams can cause a backup of melting snow that has nowhere to drain. Ultimately, this can lead to a variety of roof problems, including sagging or warped shingles, mold infestations, and cracked gutters. Ice dams are often caused by poor roof ventilation. Condensation – Condensation on the roof is another issue that frequently happens because of a lack of ventilation. It is most common during the winter because the air inside the upper floor of a house is significantly warmer than the air outside. When condensation forms, it can lead to several issues. Mold formation, however, is the most common occurrence. The mold may not actually damage your roofing material, but it looks awful and can lead to health problems for those living in your home. Flashing deterioration – When a roof is installed, qualified contractors make sure they use flashing. Flashing prevents water from leaking through the roofing material into a residence. During the winter, standing water and heavy piles of snow can all lead to damaged or deteriorating flashing. One way to prevent this is to have your contractor of choice reinforce the existing flashing. If it is already too damaged to save, however, you’ll have to pay for new flashing to be installed. Icicles – Many homeowners don’t realize just how damaging icicles can be to their roofs. Although they are pretty, they are also incredibly heavy. Thus, when they hang from downspouts, gutters, and even eaves, their weight becomes a serious issue. Icicles can actually cause roofs to collapse if they are not removed in a timely fashion. If you are currently experiencing any of these issues, or if you just want to make sure you’re in good shape going into next winter, give the Hatch Homes team a call. We will send one of our experts to assess your home’s roof and provide you with peace of mind. If any problems are noted, you will also receive information about solutions that fit your budget. We look forward to meeting you!